Baseball! We love baseball. Back in Washington DC that means cheering for the Nationals. In Yokohama, it’s the DeNA BayStars. Mark’s office organized a group outing for last weekend, so off we went. A short bus ride delivered us to Yokohama Stadium, where we joined 29,996 other fans to watch the BayStars take on the Hanshin Tigers. 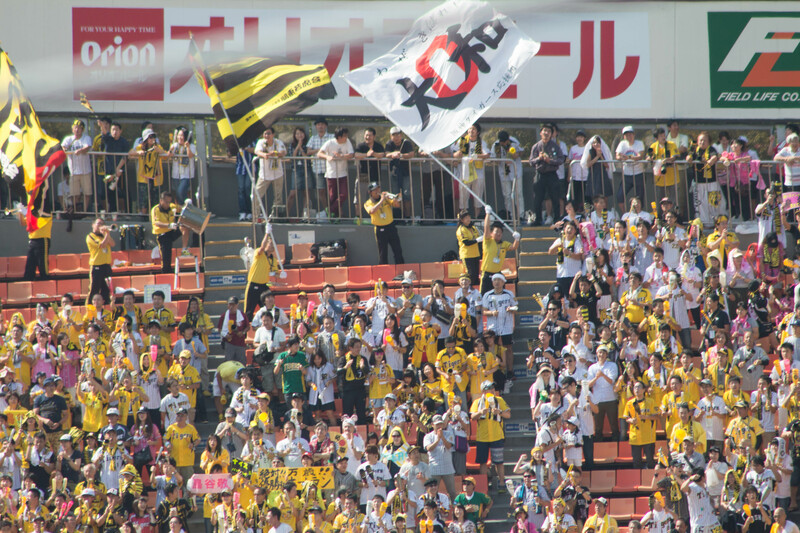 The Tigers hail from Koshien in central Japan; Hanshin is the rail company that owns the team. 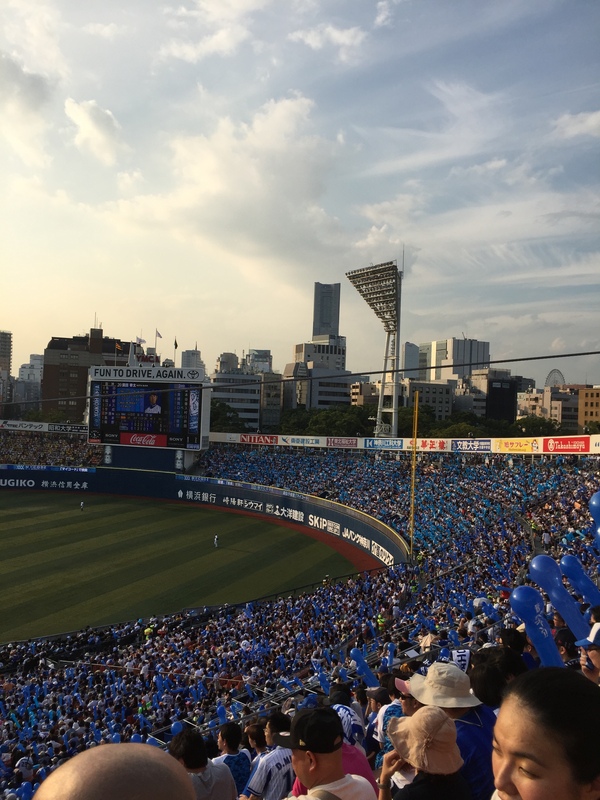 Tessa immediately noticed that the stadium was divided into Tigers fans in yellow on one side of the stadium and BayStars fans in blue on the other. The weather was insanely hot and sunny with no shade. Thankfully we were in the last row of the very highest section, and we found a little shade in the overhang right behind our row, which you can see in the photo of Tessa and me. Most of the kids stuffed back there. And me, because I have no shame. While any American sporting event begins with the singing of the national anthem, Japanese baseball games kick off the festivities with cheerleaders, mascots, and Power Rangers. Naturally. Washington Nationals games used to feature a t-shirt gun. In between innings the cheerleader-ish people ran out onto the field with clumsy, single-load t-shirt guns. One cheerleader would load the the gun one shirt at a time, ram the shirt down with a stick, and the other cheerleader fired the gun. It seemed like a cool enough idea, but somehow the execution never really worked. About two years ago they nixed the t-shirt gun and starting throwing shirts into the stands. Yawn. Enter the SWAG bazooka. The Power Ranger mascot dude fired something (baseballs, maybe?) 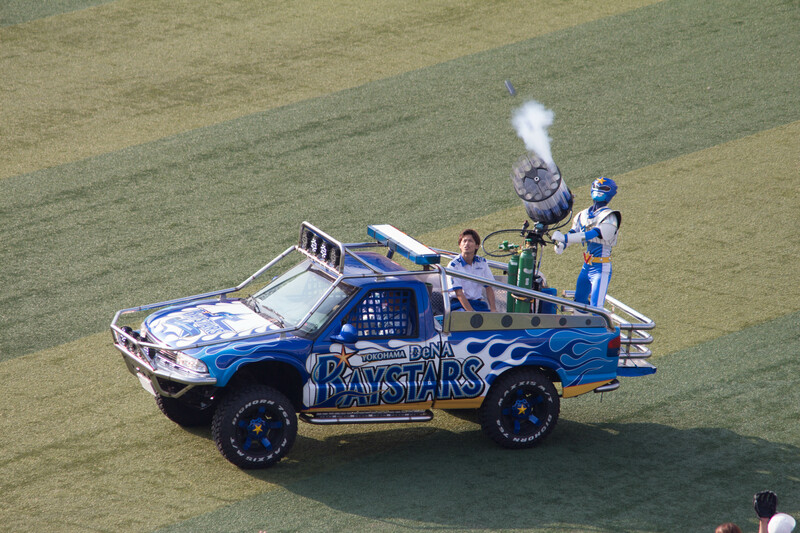 into the stands with a bazooka mounted on the back of a tricked-out, BayStars SUV. It was awesome. He reached the highest sections, where we sat. Most of you have likely heard something about the non-stop cheers and songs at Japanese baseball games. I had, and I was still completely unprepared for the constant cheering. There’s a team song, plus a song for every player. I’m not talking about “Let’s Go Harper! -clap, clap, clap clap clap-“. Actual songs, with a pep band in the stands to keep everyone together. Like this. Notice the plastic baseball bats, constantly in use. It’s loud. Really, really loud. The game itself showed few differences with American baseball. The scoreboard showed the same kind of info. One difference I noticed was the listing of players by position number (1-9) instead of jersey number. 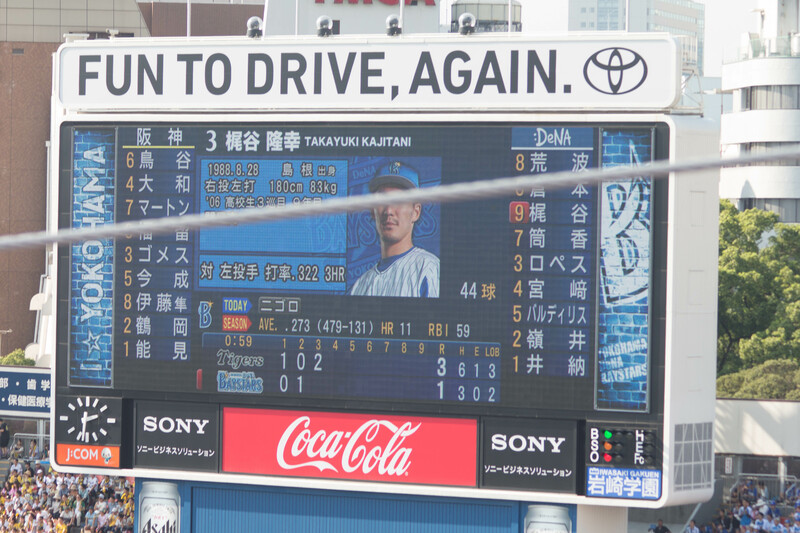 The jersey number and name in romaji only showed up on the screen when that player was at bat. Since I don’t read kanji it was a bit difficult to figure out who was who unless they were at bat. Snack time! 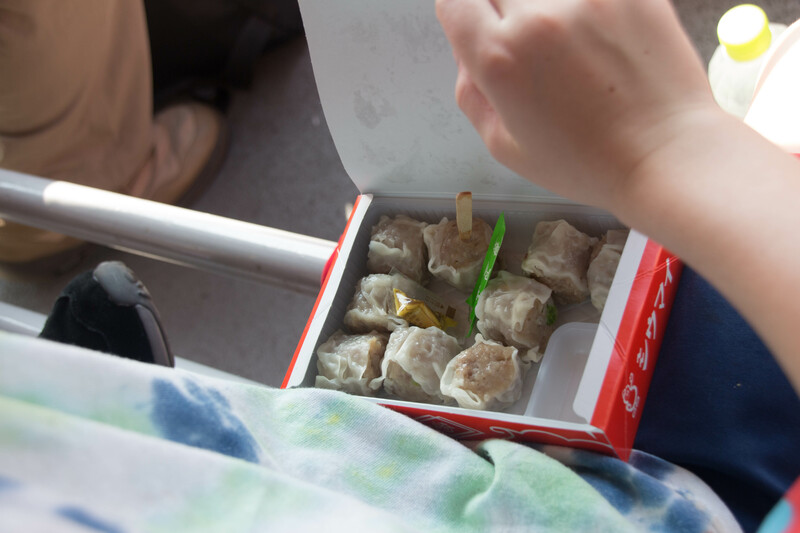 Tessa tried Japanese-style curry at first but opted for fried rice instead, while Cy ate shu mai dumplings. We saw some hot dogs on a stick for sale but no one actually eating them. Heeeeey, beer lady! 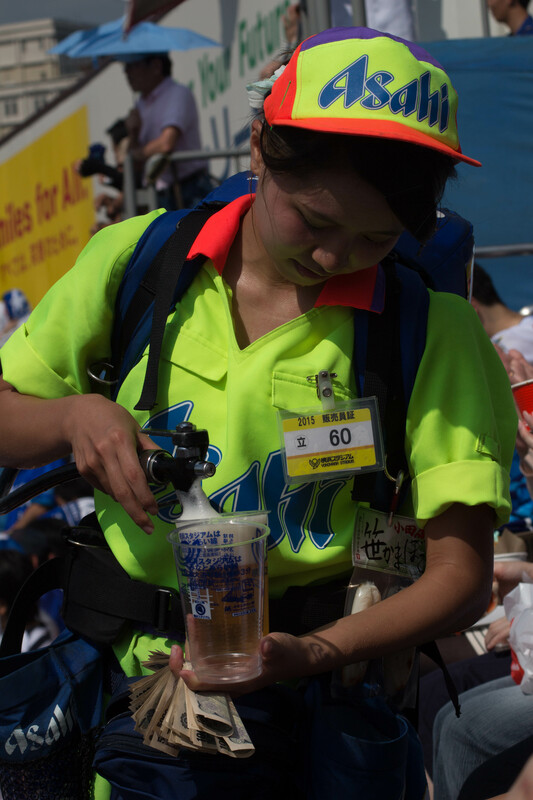 In Japan the most important of beverages is delivered by young women roving the stands sporting beer backpacks. 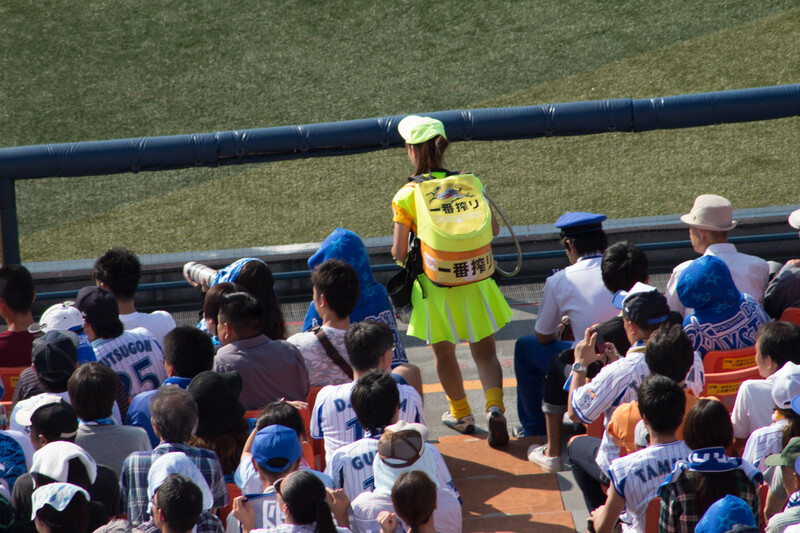 Note the fluorescent-colored uniform, which makes the beer gals easy to spot across the section. Because Priorities. Apparently Japanese relief pitchers are delicate, hothouse flowers, just like in the U.S. Walking from the bullpen must exhaust them terribly–hence the delivery to the mound by souped up vehicle. We hoped to make it to at least the seventh inning stretch, and we did. The Tigers fans launched their yellow, sperm-shaped balloons earlier in the game, and the BayStars fans had their turn during the seventh inning stretch. We left after the seventh inning stretch, which was already three hours in to the game. Perhaps if the weather were cooler we would have stuck around longer, but we were pretty much puddles by then. 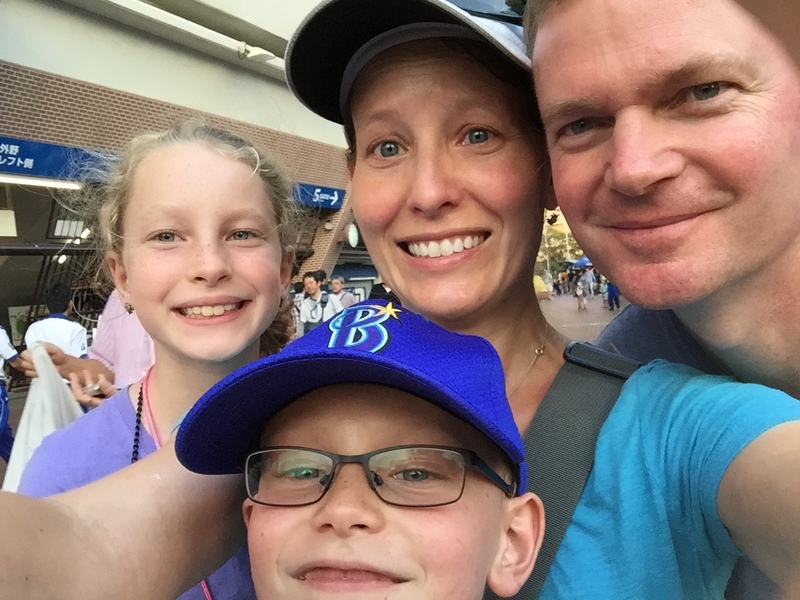 We later learned that the BayStars won, 7-5. 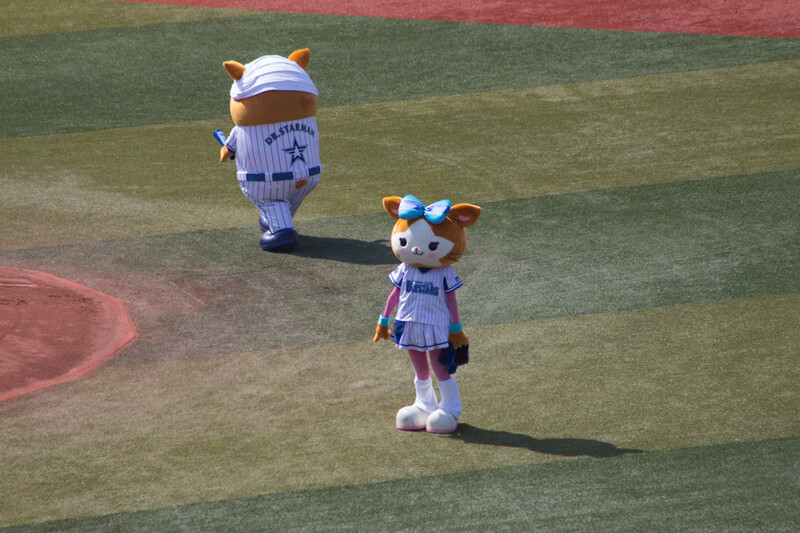 Go BayStars! See you next time. See you next time, BayStars! Time for a Kosutoko run! 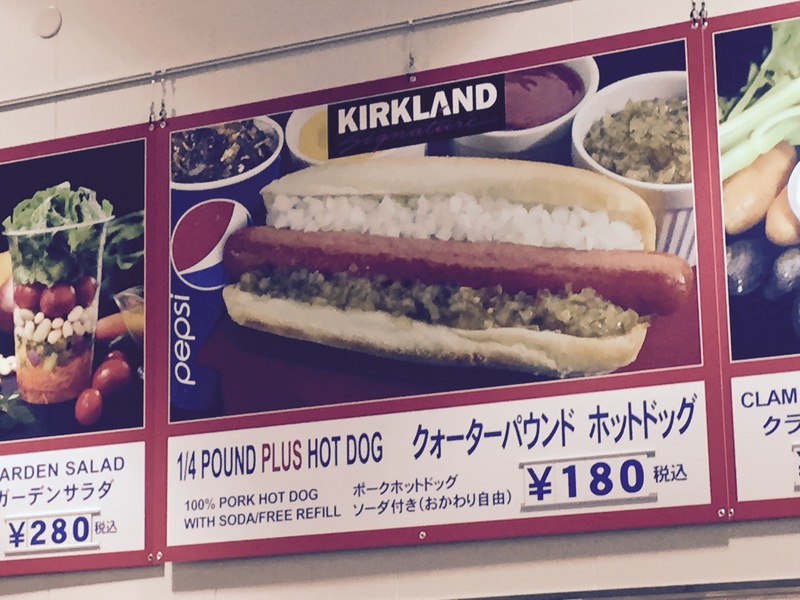 That’s Costco for you gaijin out there. Before we moved here I heard that there was Costco nearby, so I naturally assumed that it was located on the naval base and not out in town. Surely a country with apartments starting at 10 square meters (about 108 square feet) would not embrace mega-packs of 27 rolls of oversized toilet paper. Except that they do, and Costcos abound in the greater Tokyo area for sailors, expats, and Japanese alike. So I grabbed my Costco card from the States and set out for the adventure with my friend Stephanie. 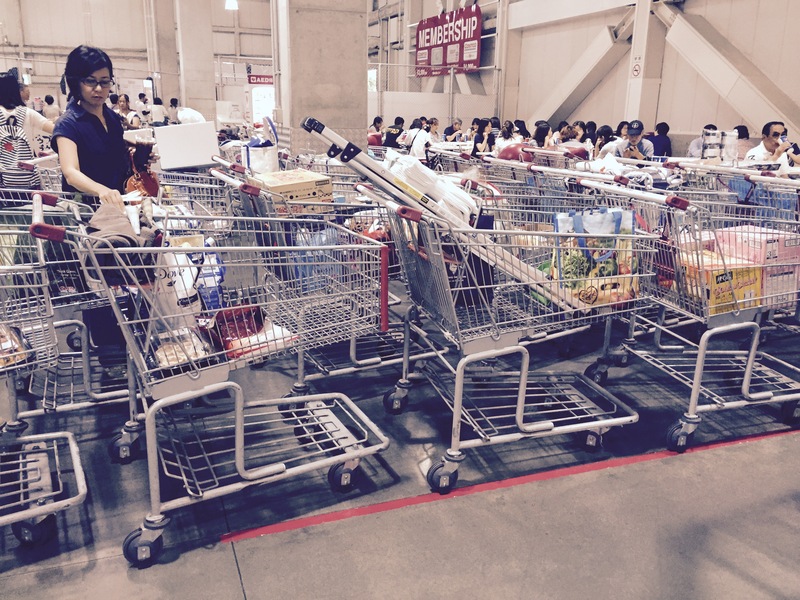 I walked in the door and was greeted by the usual Costco layout. I saw some familiar products and got excited. 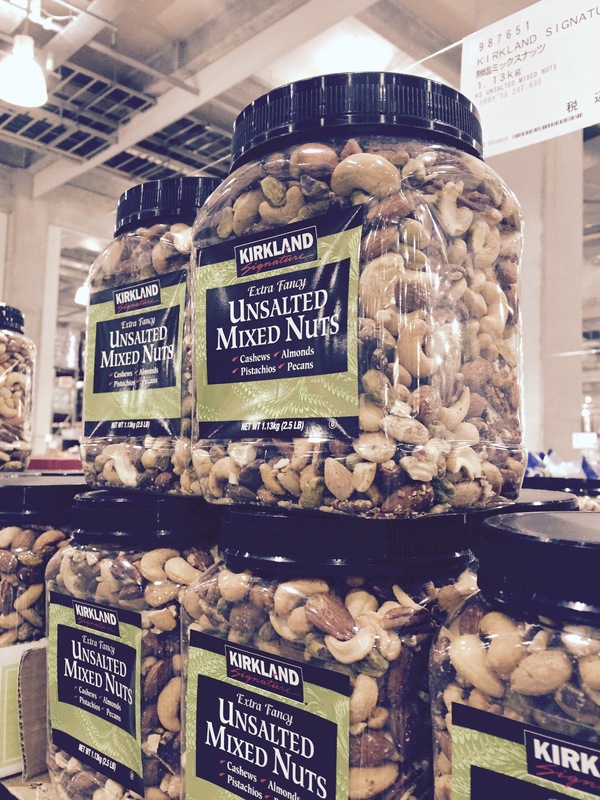 Yay, a giant container of unsalted mixed nuts, the same ones that we love at home! I grabbed a container. Then I noticed the price. These are about $12.99 at home. Is that 2798 yen, or about $23? One dollar is about 120 yen, so I’ve gotten fast at lopping off two zeros and knocking off about 20%. I put the nuts back. Some things cost about the same as in the States, like the giant bag of dried cherries for 1300 yen ($10.80). The cherries made the cart. But the $16/lb fresh blueberries did not–I just couldn’t do it. I later talked this over with Jen, another American who has been here a while. She did the same on her first Costco visit, sputtering at the high prices and putting stuff back. She added that eventually she just sucked it up and paid whatever it cost. I get it, but I’m not there yet. 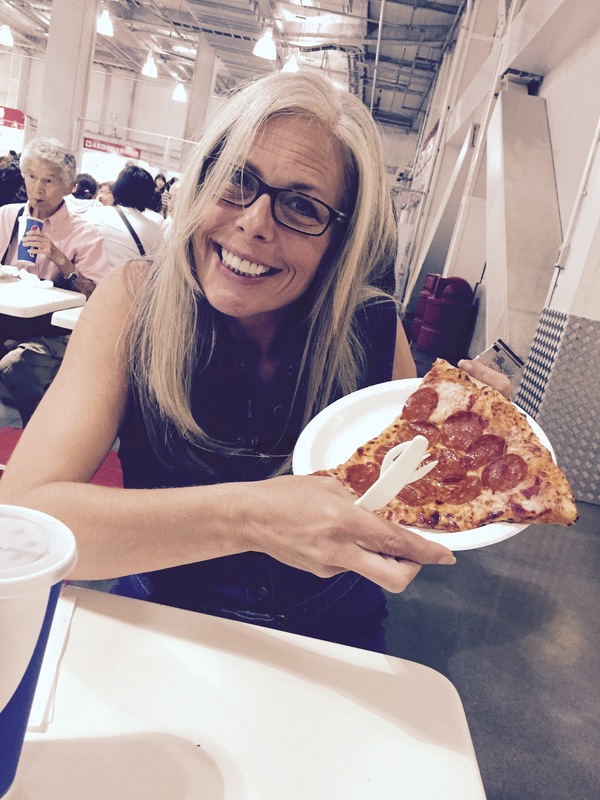 The Costco pizzas mystified me. They looked far too large for my tiny Japanese oven, so I measured the pizza (15 inches across) to check at home later. Sure enough, said pizza will not fit in my oven. Yet the pizza display was just as big as at home, and the crowds just as enthusiastic. 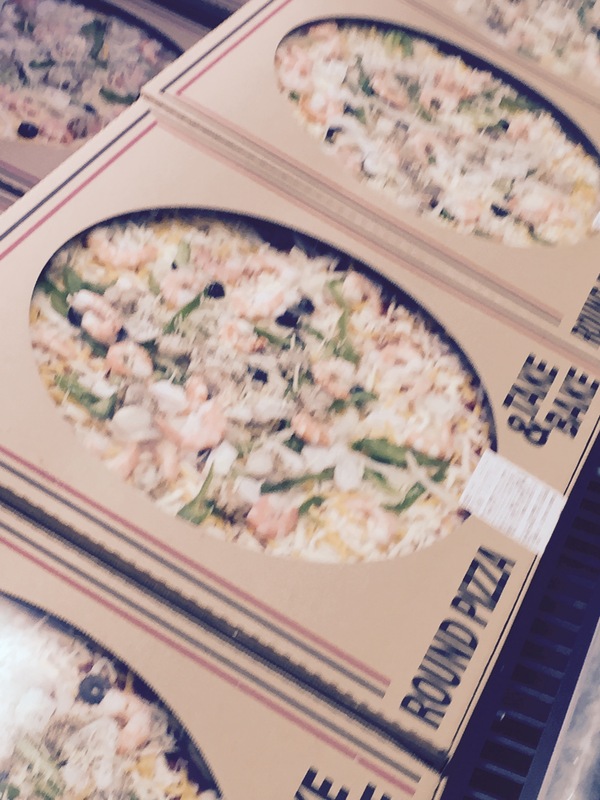 The pizza section held three varieties: a few plain cheese pizzas, a few with pepperoni, and the vast majority with mixed seafood, as shown at left (sorry about the blurry photo). A successful Costco trip means one thing: lunch at the snack bar! You will all be relieved to hear that the foot-long hot dog holds court at the snack bar, just like at home. And a steal at 180 yen ($1.50)! My buddy Stephanie, enjoying a post-shopping slice. Doesn’t she have a great smile? I opted for a slice. 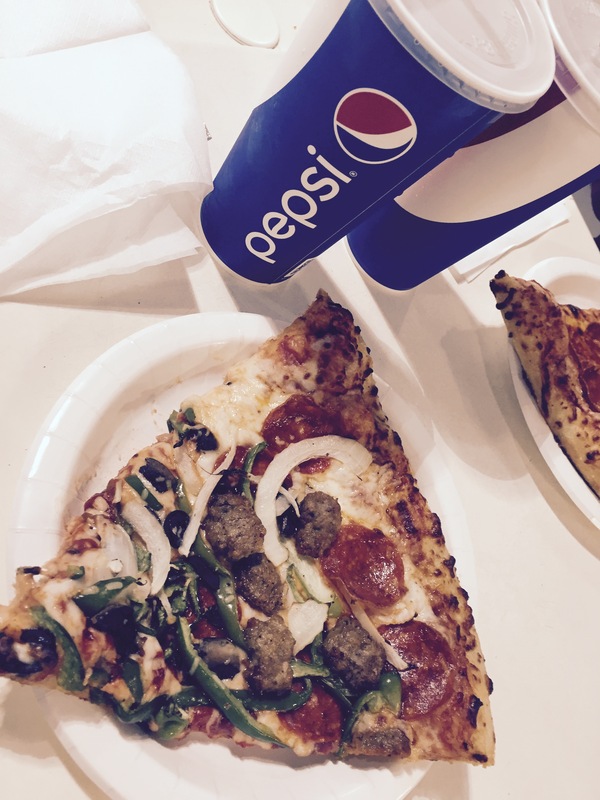 Unlike the mixed seafood pizza majority in the main store, the take and bake pizzas near the food court were all the traditional American Everything pizza, with sausage, pepperoni, and veggies. Perfectly aligned carts in the cart holding area near the snack bar. Except for that scofflaw who crossed the red line! Not me, BTW. Note the tidiness of the cart holding area. No attendant enforced this; the Japanese patrons just do it. For a split second I considered turning my cart the other way, but I chickened out. When I arrived in early August, I spent my first week at an orientation class that the Navy requires for all new personnel. 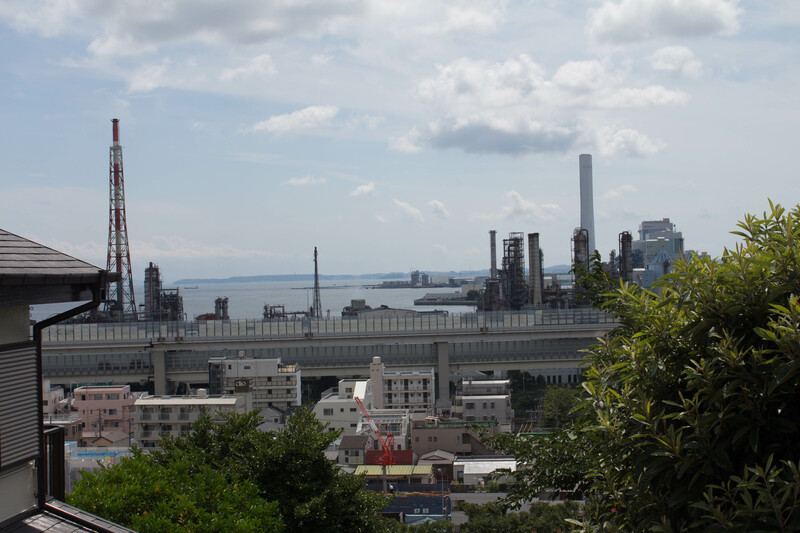 One of the speakers showed a dated but sobering movie about American sailors serving time in Yokosuka prison, with its forced labor, unheated cells with glass-less windows, and so on. The film producers even interviewed American prisoners to emphasize the grim reality of life behind Japanese bars. “Don’t drink and drive, don’t shoplift, don’t get drunk and stupid and assault someone,” the speaker cautioned. Normal people react with horror. Can you imagine, they ask. But not me! All I could think was “But I bet their Japanese language skills are AMAZING.” Totally, absolutely *not* the point of the movie, but I can’t help it. Similarly, when normal people hear that a friend is moving overseas their first thought are likely The exotic places you will see! The food! But not me. I immediately start wondering about mundane, day-to-day issues. How often will you cook, and where will you buy groceries? What will you for medical and dental care? So what do we do for our medical care? Mark works for the Navy as a civilian, not an active duty service member. Back in the States only active duty military get medical care covered at military hospitals; government employees like Mark have private health insurance and see doctors on the open market, like most of you in the States do. However, Navy civilians get to use Navy hospitals when stationed overseas. Before our arrival I assumed that we would use the Navy hospital on base. Until recently, the hospital would see patients like us and bill our insurance company directly. 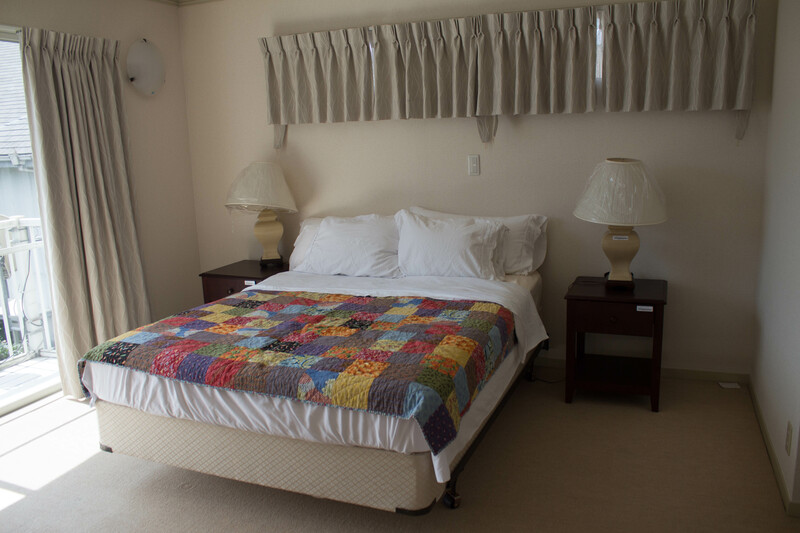 The process was streamlined and uneventful for the patient. Unfortunately, that all changed this summer. 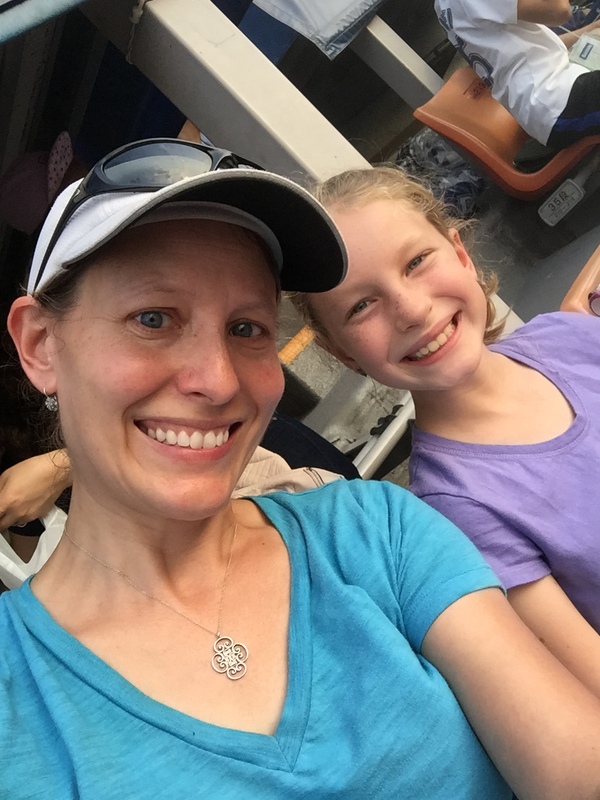 As of July, the process became a nightmare: go to your appointment, return to the hospital seventeen days later for the bill, submit to insurance via email, then hope that insurance pays on time because the hospital sends your bill to a collection agency on Day 60. Awesome. Add to this the commute of 40 minutes each way, the early appointment times that would mean pulling both kids early from school–and suddenly Navy medicine does not look so good. 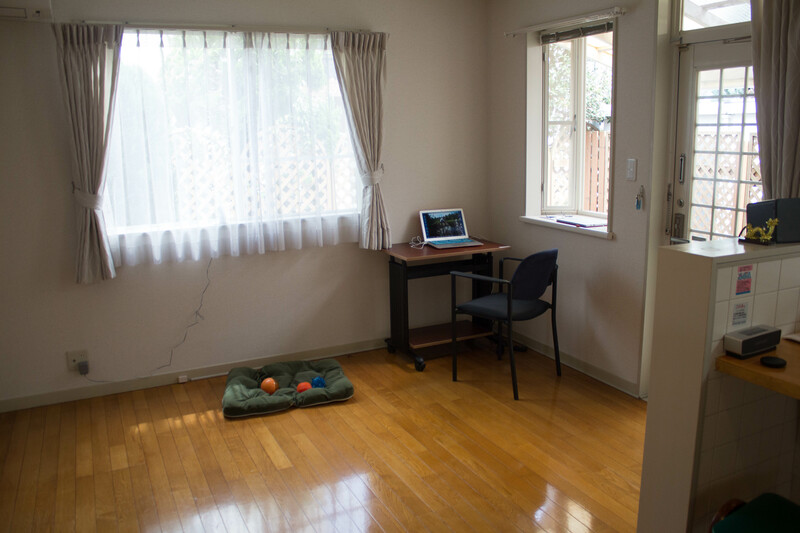 The Bluff Clinic sits right next door to the kids’ school in the part of Yokohama referred to as–surprise!–The Bluff. 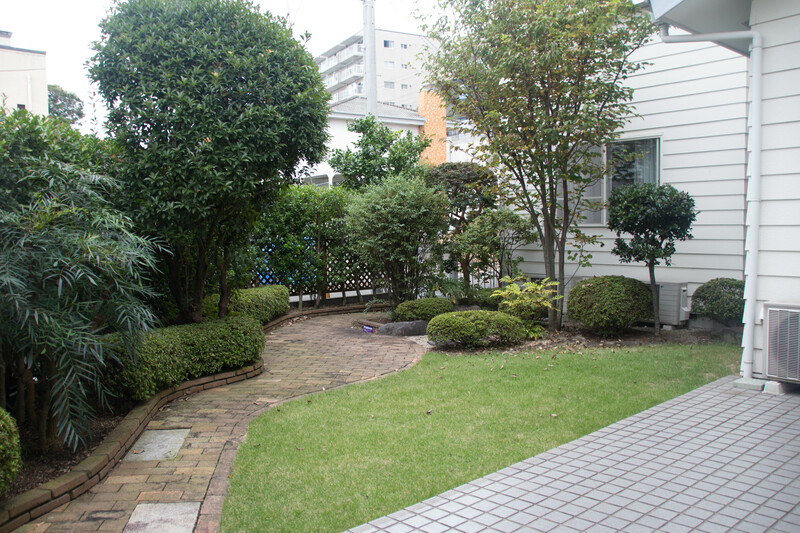 Yokohama was the first port in Japan opened to foreigners in the nineteenth century, and the clinic has been caring for expat patients ever since. The clinic is small with only one physician and one dentist. 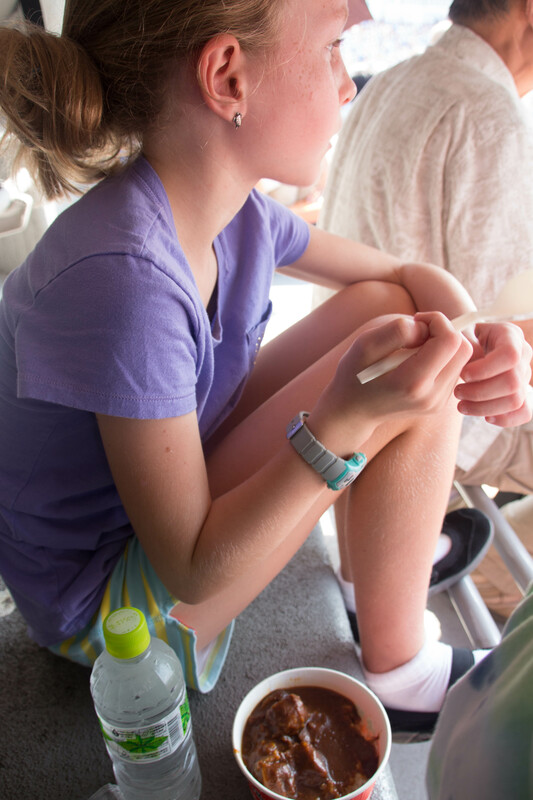 We heard of the clinic from other school families, so I made an appointment for Cy’s annual physical exam. A French mom at school described the physician as nice but extremely reserved and not terribly warm. She wasn’t kidding. We arrive for our appointment and the doctor starts asking Cy questions about school, his eating habits, and so on. After a few minutes of this, the nurse takes Cy from the room “for some quick measurements.” I assume that this meant his height and weight, and that he will return shortly. So after Cy leaves the room, the doctor starts with some minor chit chat. The weather! Pause. How do I like Japan. Pause. Cy is gone a long time. Normally whenever someone asks me questions I answer them, fully. I’m a talker, like many of you. Ask me a question, and I go on. And on. Sometimes I detach from my talking self and think STOP TALKING. Which of course makes me talk even more, and faster, and louder. So for once I give concise, disciplined answers. And the doctor pauses. Then pauses again. Then he asks, “So have you joined any….gyms?”. I suddenly realize that the poor man has simply run out of material. So I start talking, at length. I give the wordiest, most insanely boring answer imaginable. But it isn’t merely an answer, but a gift–the gift of the doctor not having to think of another question to ask. Cy returns and we both sign in relief. Healthy boy, all looks good! It turns out the nurse also checked his hearing, vision, and stripped him down for a quick once over. I would have given longer small talk answers from the start had I known! The bill for this visit came in at 6400 yen, or about $53. And that’s the full price of the visit, not just the co-pay. It’s safe to say that The Bluff Clinic will see us again. And I’ll give longer answers next time. We’re in our house! We have been here almost two weeks now. 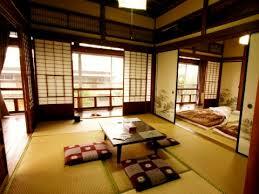 Ask anyone to picture a Japanese house, and a few images come to mind, such as the traditional…. 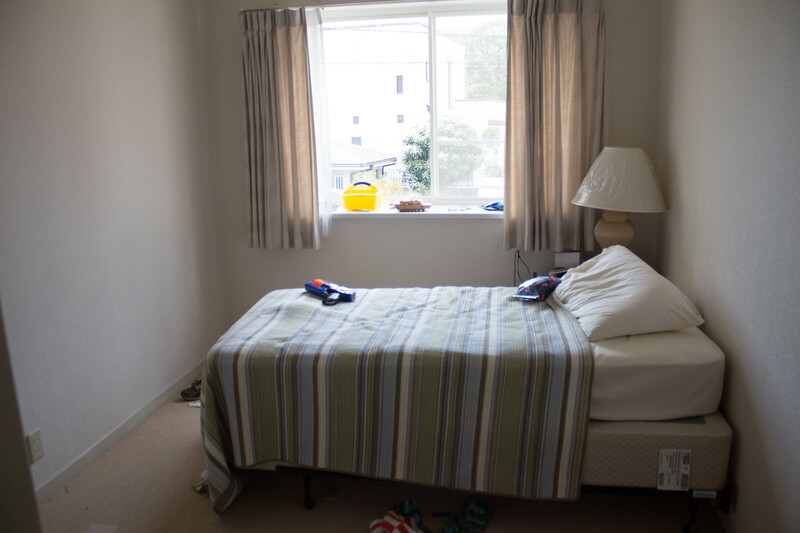 Our actual house is both larger and more mundane. Here it is! 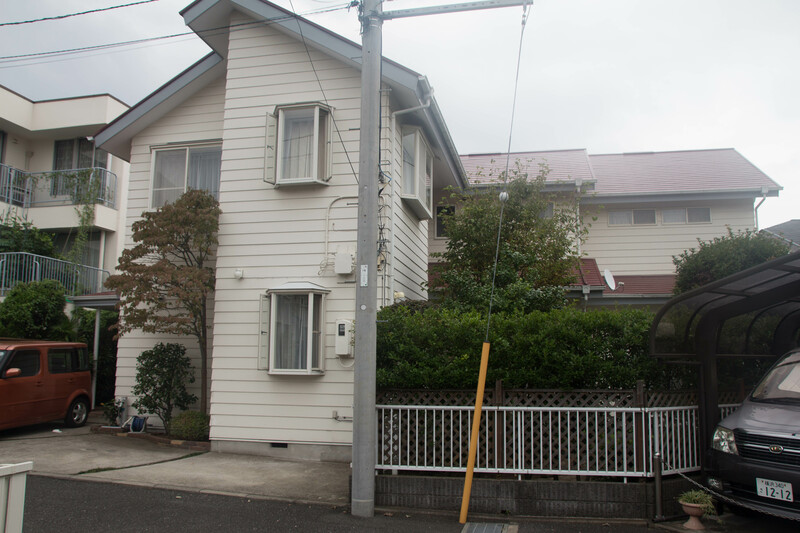 The house is named Takinoue House after our neighborhood, Takinoue. 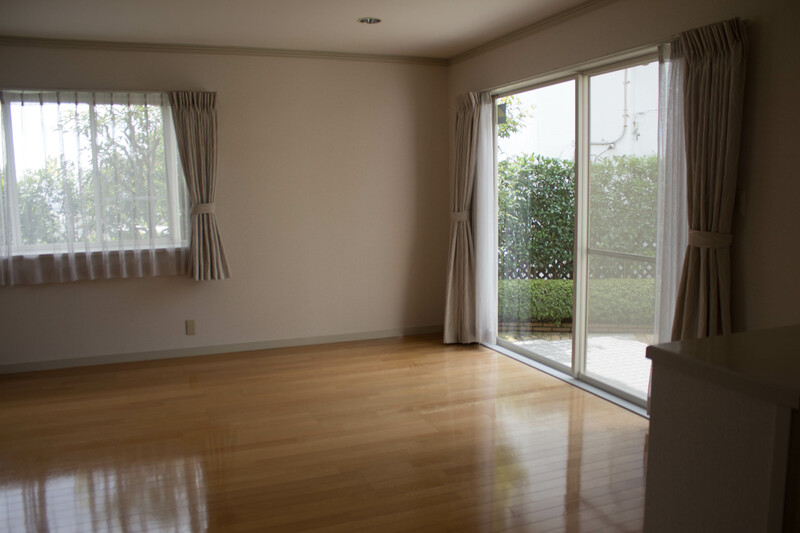 Takinoue House. Admittedly, the curb appeal is a bit lacking. 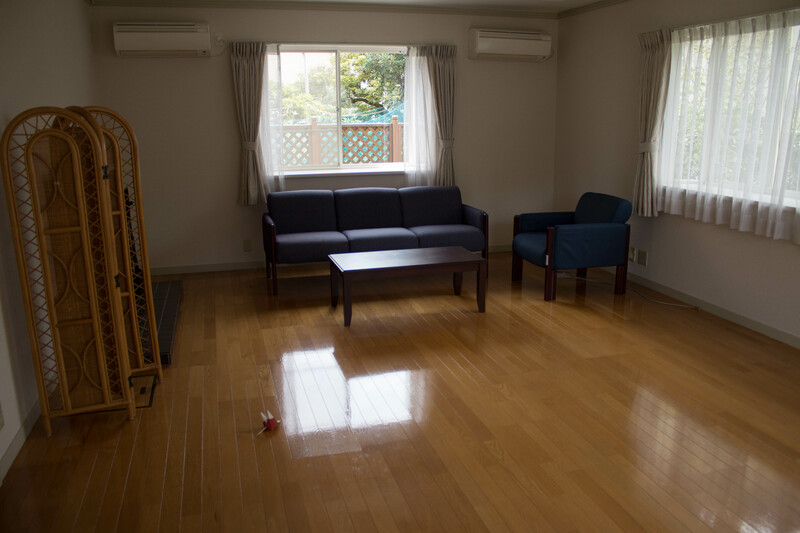 Back in Washington DC, we had our household goods pack-out in July, before we had our house in Japan picked out. Obsessing over web listings showed that we would likely end up in a house bigger than we originally thought, but we still decided to ship very little furniture with us, just in case. 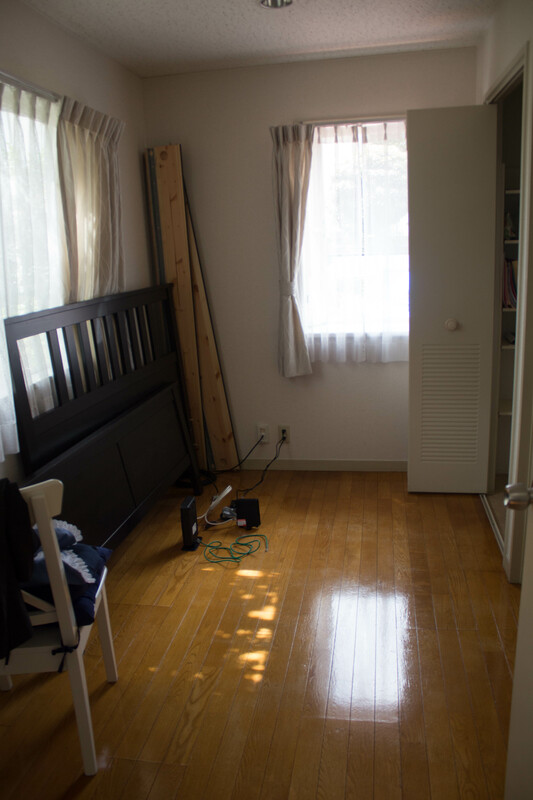 For a change, we underestimated our house size–not the typical problem when moving to Japan. The kitchen. And chair socks! Available at the 100 yen shops. 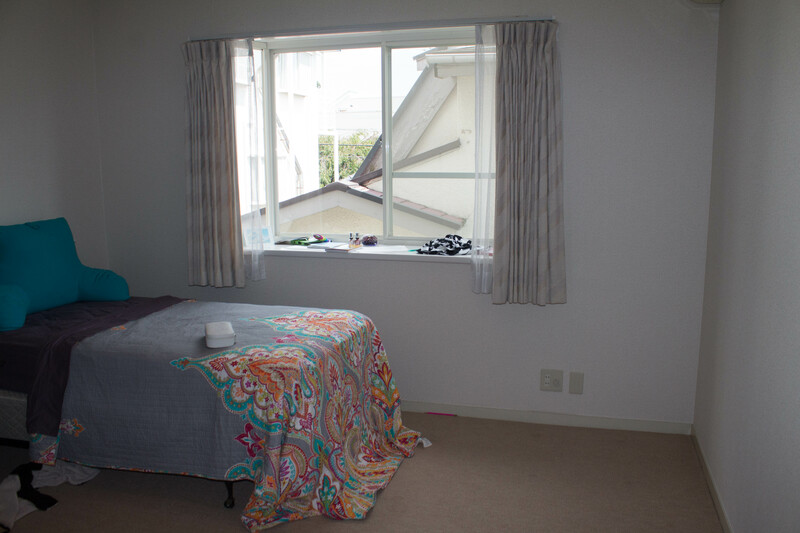 The house is roughly 2300 square feet and has four bedrooms upstairs, a small bedroom (Bonus Room, in realtor-speak) on the first floor, and family room off the kitchen, plus LDK (living, dining, kitchen). Here’s the kitchen! 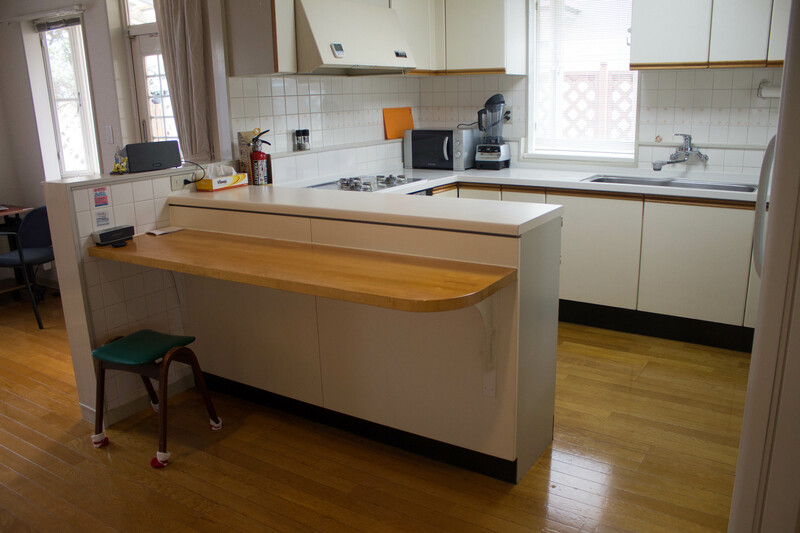 We have a full-sized American fridge and even a circa-1987 GE dishwasher. Three burners plus a fish broiler make up the standard Japanese cook set. The built-in oven is less common. The only thing that’s not American-style is the stove and oven. 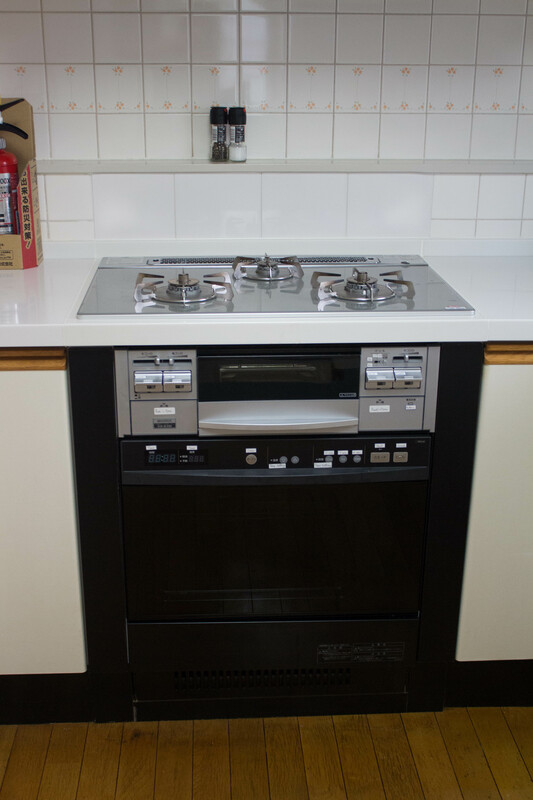 I saw mostly American-style range-ovens when browsing listings online, and I assumed that we’d end up with one. Unfortunately, we did not. While the fish broiler (drawer right under the burners) is awesome, the tiny Japanese oven on the very bottom–not so much. I packed a fair amount of bakeware expecting a full-sized oven, and unfortunately only my quarter sheet pans will fit. Our household goods arrive in two shipments. The first batch–the express shipment, by air–was limited to 1000 lb., no furniture, and no more than two bicycles. That arrived the day we moved in. The rest of our shipment including our furniture and Stuff is still wending its way across the Pacific; it should arrive some time in early October. Meanwhile, we are making do with loaner furniture from the Navy. 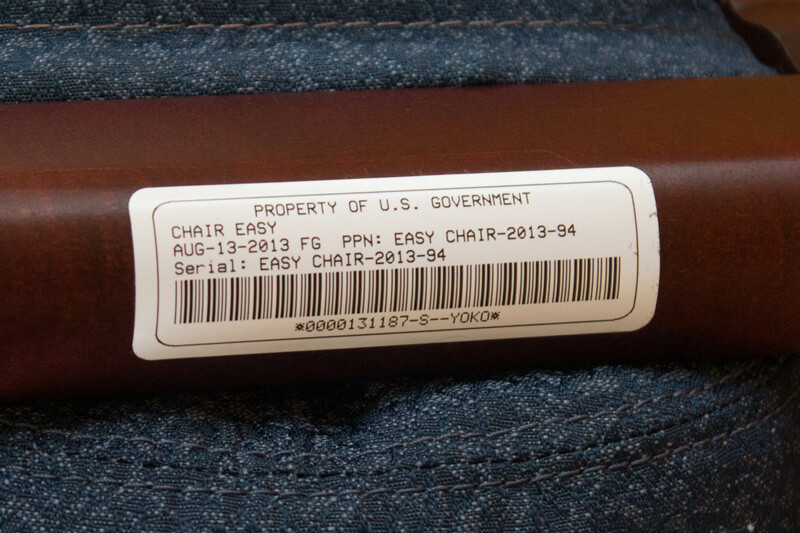 The housing office asks how many of each item you need, and the next day a truck brings you your barcoded furniture! 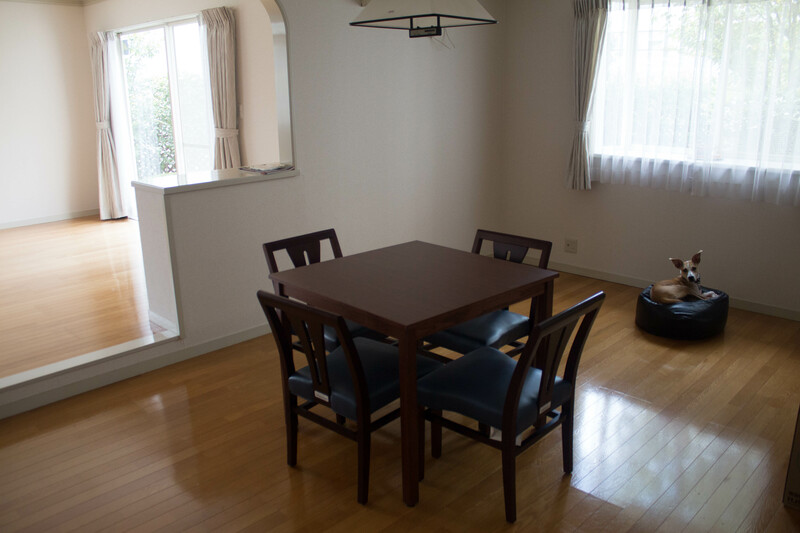 It’s actually pretty great, as long as you don’t mind your house looking like the lobby of a Motel 6. Also everything has a giant barcode on the front with awesome/humorless capitalized descriptions. 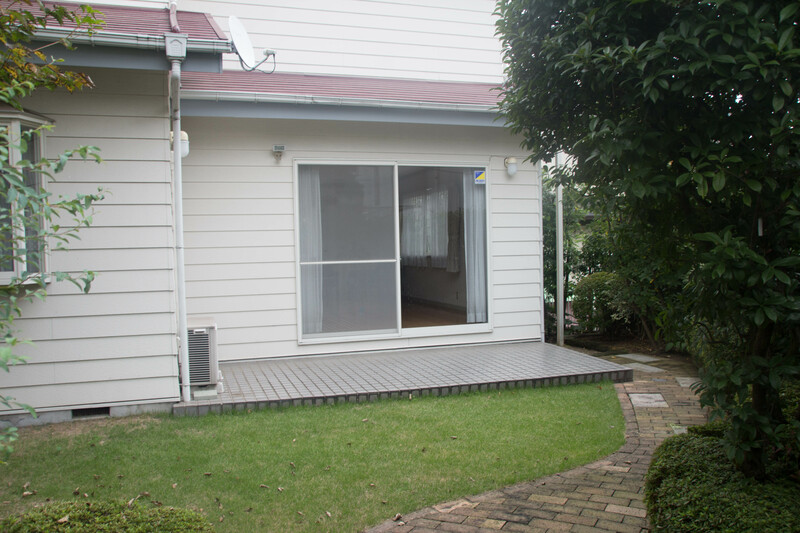 Without further ado, here’s the rest of the house. Enjoy the tour! I will repost once we get our stuff set up. 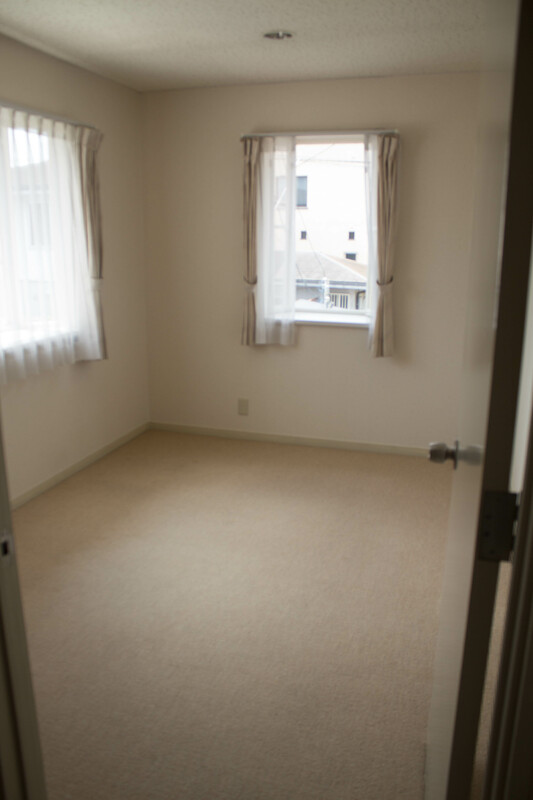 First floor bonus room, a.k.a. 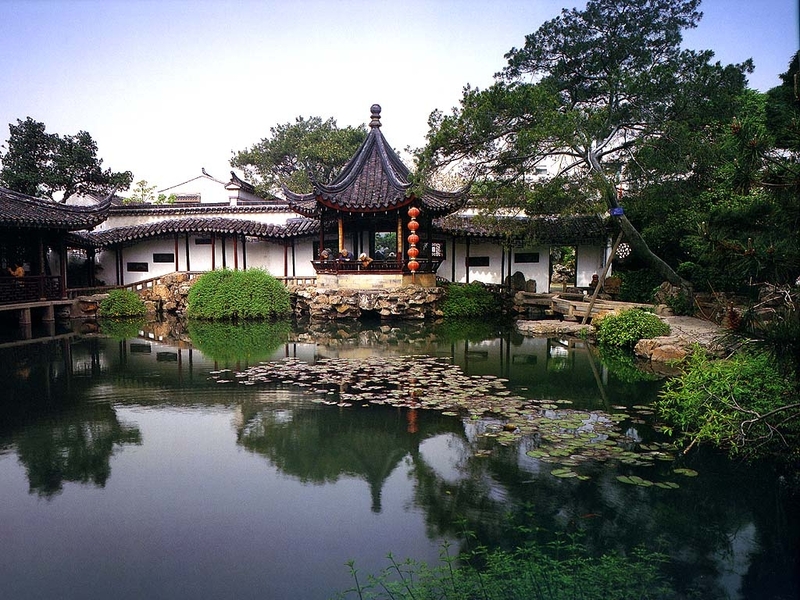 future office, a.k.a. future guest suite! Has its own bath. Our ocean view! If you can look past the natural gas flare, anyway…..